HANDMADE JOURNAL COVERED IN A VERY COOL ASIAN PRINTED FABRIC THAT IS SHADES OF RED, BLACK, TEAL AND TAN.IT ALSO HAS METALIC GOLD HIGHLIGHTS. IT MEASURES 9" WIDE x 6" HIGH WITH A WRITING AREA OF 7 1/8 x 5.5". INSIDE IS A THICK BOOK (5/8" THICK) OF CREAMY WHITE TEXTURED (A BIT LIKE COLD PRESSED WATER-COLOR PAPER) TEXT-WEIGHT PAPER, WHICH TAKES MANY MEDIA VERY WELL INCLUDING WATERCOLOR, COLLAGE, PENCIL AND INK. EVERY JOURNAL I SELL IS MADE BY ME AND HAS DECORATIVE ENDPAPERS. 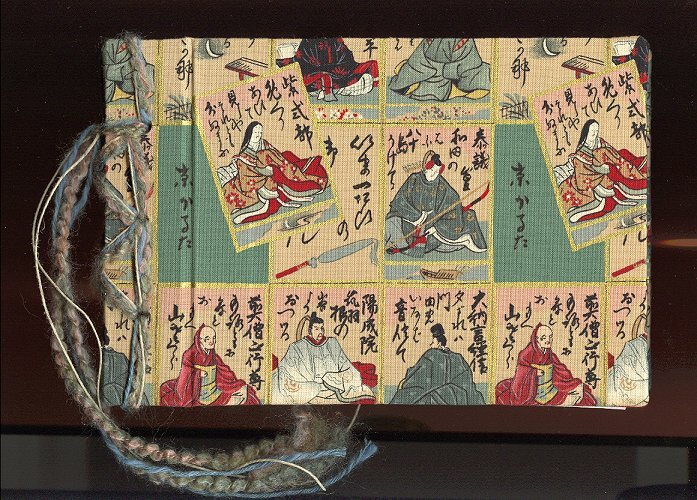 THIS PARTICULAR JOURNAL IS BOUND USING DECORATIVE FIBERS INCLUDING HEMP.